MINNEAPOLIS - Why did the turkey cross the road? To show you who's the boss! 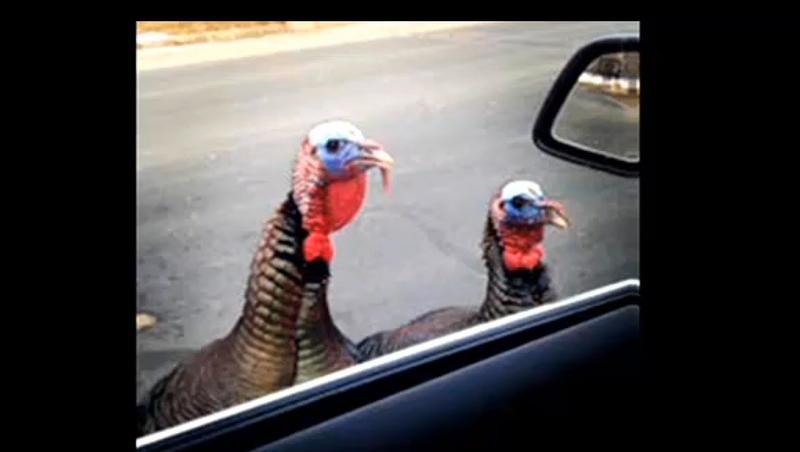 A pair of turkeys is causing problems for drivers in the Minneapolis metro area, and not even police can scare them off, CBS Minneapolis reported. An officer in the city of Chaska, southwest of Minneapolis, recently took pictures of turkeys who were strutting their stuff in the middle of the a major road. The two male turkeys weren't allowing vehicles to pass and were also coming up right to them. The turkeys forced several drivers to turn around. Police say the male turkeys can be aggressive this time of year as they try to establish their dominance during the mating season. They advise motorists that if they come across angry turkeys, they should just slowly drive forward and the birds will eventually move out of the way.